RISK PARITY. MAXIMUM DIVERSIFICATION. TRUE BALANCE. economic regimes through maximum diversification and true risk balance. Risk Parity strategies are built on the philosophy that nobody knows what’s going to happen next. As such, they are designed to thrive in all economic regimes. Despite the variety of specific Risk Parity implementations, one characteristic remains constant across the board: Through diversification and thoughtful risk allocation, Risk Parity creates true portfolio balance. They do not balance risk across economic exposures in a balanced way. They do not manage risk in response to changing economic and market conditions. A variety of Risk Parity implementations are designed to resolve some or all of these shortcomings. Risk Parity arose as a solution to the lack of balance in traditional “balanced” funds. The goal was to create a portfolio that could do well under all economic and market conditions, capitalize on the full promise of diversification, and understand and manage risk. The concept of Risk Parity was pioneered by Ray Dalio, one of the world’s most prominent investors. Following a short career as a risk analyst Dalio founded Bridgewater Associates in 1975 and grew it into one of the largest alternative asset management companies in the world, with assets of $150 billion. Dalio’s investment philosophy from the earliest days focused on preparing for surprises by analyzing risk exposures. He and his colleagues spent decades seeking to answer a simple question: What kind of portfolio would perform well across all economic conditions and market environments? For Dalio, traditional portfolios including the ubiquitous 60% US stocks / 40% US bonds failed this test. In 1996 Bridgewater launched the world’s first Risk Parity fund, the All Weather portfolio. But its underpinning philosophy was conceived nearly a decade prior. Though the ‘data’ indicated one thing (to balance assets via inflation sensitivity) common sense suggested another. The message – don’t blindly follow the data. Ray proceeded to sketch out the four boxes diagram below as a way of describing the range of economic environments any investor has faced in the past or might face in the future. The key was to put equal risk on each scenario to achieve balance. Investors are always discounting future conditions and they have equal odds of being right about any one scenario. The four economic regimes created by variations in growth and inflation greatly inform whether specific asset classes will thrive or wilt. 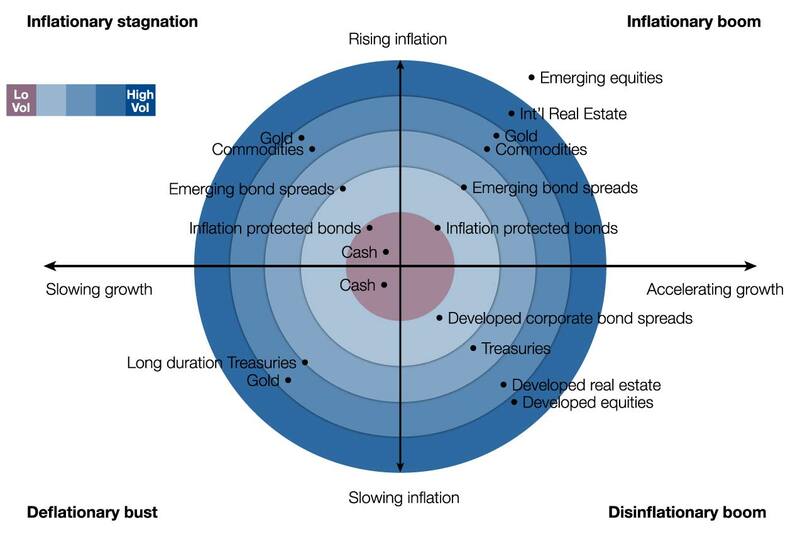 Figure 1 illustrates the framework Prince and Dalio outlined decades ago, and shows which asset classes might be expected to thrive under differing conditions. Assets toward the middle are least sensitive, while assets toward the edge of the diagram are most sensitive to each regime. Furthermore, Figure 2 shows how asset classes are constantly reshuffling leaders and laggards. It also shows that diversification affords access to asset classes with the potential to deliver positive returns, even during the most difficult markets like the 2008 Global Financial Crisis. Using more diverse asset classes is an important starting point, but it fails to capture all of the benefits of diversification. Most investors assume that the percentage of capital allocation equates to a portfolio’s risk allocation, such that a 60/40 portfolio would derive roughly 60% of its risk from stocks. As Figure 3 shows, the reality is that such a portfolio tends to be dangerously overexposed to equity risk. Source: ReSolve Asset Management, Data from Global Financial Data and CSI. According to Bridgewater, a global 60/40 portfolio is even more concentrated, with 98% of risk derived from the equity portion of the portfolio. Investors who are seeking balance and diversification will not find it in a traditional asset allocation implementation. The All Weather portfolio quickly became one of Bridgewater’s flagship products. But they were not alone in this field for long. Edward Qian, a US academic now serving as Chief Investment Officer of PanAgora Asset Management, coined the term Risk Parity in a 2005 article. PanAgora has been running Risk Parity strategies for almost a decade. Other Risk Parity pioneers include rules-based asset manager, AQR. Risk Parity products were initially offered only to institutional investors. The strategy’s unique approach to portfolio construction was slow to catch on until its strong performance in the market crash of 2008-9 contrasted with the weakness of traditional balanced funds. The relative stability and robustness of Risk Parity made it an attractive option for pensions, endowments and other institutions. And indeed, according to a 2015 Chief Investment Officer Magazine survey of 272 such investors, 35% of institutions had invested in some form of Risk Parity strategy. A number of alternative asset managers offer different forms of Risk Parity. Here are the main differences. Strategic implementations use fundamental assumptions about how assets react to a variety of economic environments to construct an allocation that is stable over time. These portfolios use long-term theoretical assumptions about correlations and risk, regularly rebalancing back to their original, relatively static target weights. Others practice dynamic asset allocation, adjusting their portfolios based on more recent measurements of risk and asset class relationships. Dynamic allocators account for the fact that risk and correlation measures can vary widely from their long-term averages, for years at a time. Using more current measures offers important opportunities to improve performance by reducing exposure to some of the worst performing assets – for example, US stocks when the Tech Bubble burst; REITs and global stocks during the Global Financial Crisis of 2008, and; more recently commodities in 2014 and 2015. 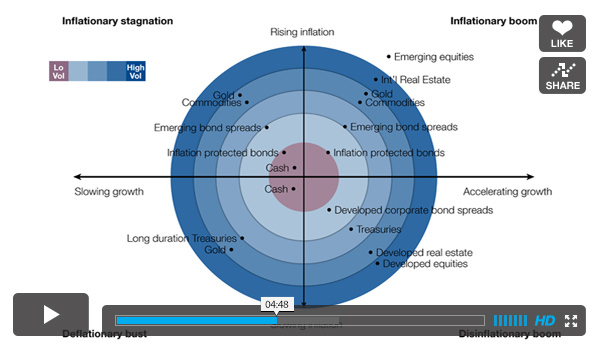 Bridgewater allocates risk based on the four potential combinations of inflation and growth regimes. AQR emphasizes market risks divided into four different buckets: equity, nominal interest rate, credit/currency, and inflation. PanAgora break it down into 3 categories: equity risk; interest rate risk; and inflation risk. The differences in risk categorization notwithstanding, all these firms still follow the first principle of Risk Parity by allocating risk equally across major economic outcomes. Some Risk Parity solutions use as few as three asset classes: global equities, global bonds and commodities. Most use six to ten asset classes. Some, but not all, RP portfolios include inflation-protected bonds, gold or real estate as separate classes. By virtue of their extreme diversification, Risk Parity portfolios often exhibit very low risk. As a result, many Risk Parity solutions employ leverage to increase risk and return expectations. The use of leverage varies widely in most publicly-traded mutual funds, from 0% up to 700% or even higher depending on target risk level. Regardless of the amount of leverage used, Risk Parity is fundamentally about risk balance. Using leverage, it is possible to simultaneously balance risk contributions across asset classes, which over a full market cycle may potentially deliver equal performance at significantly lower risk compared to traditional approaches. Several managers use techniques to under- or over-weight individual asset classes relative to their neutral Risk Parity weights. These techniques, if applied with discipline and rigour, provide an opportunity to both lower risk and increase long-term returns. “Tilts” to value, momentum or other factors are based on research showing that such factors outperform consistently, over long periods and varying market conditions. Retail products only began to crop up by 2010. About a dozen mutual funds specializing in Risk Parity were offered by mutual fund companies. 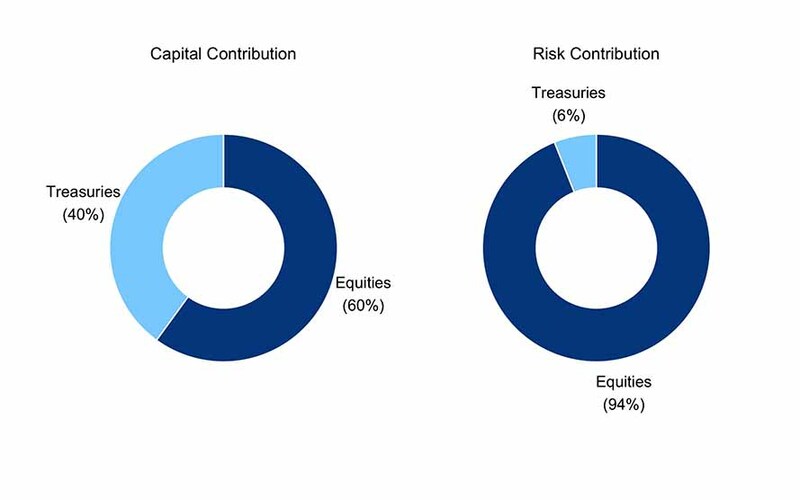 In all, Risk Parity strategies are estimated to comprise about $600 billion in total assets, with the overwhelming proportion implemented by institutional investors. While this seems like a large sum at first glance, it is paltry in comparison to estimated total global market capitalization of about $91 trillion. Perhaps the reason why Risk Parity is not yet a dominant allocation strategy is that the strategy is difficult to benchmark, being designed to intentionally lag market booms and thrive through market busts. It could also be attributed to a fundamental misunderstanding of the mechanics and underlying philosophy of Risk Parity. Or, encouragingly, perhaps the reason is simply that Risk Parity is still in the earliest stages of the technology adoption curve, and is about to experience rapid growth in widespread adoption. No matter what the reality, as Risk Parity evolves, and becomes more accessible to every investor, it provides a compelling alternative to the risks plaguing traditional portfolios. The world’s largest institutions use Risk Parity. Why aren’t you? With US stocks and bonds at valuation extremes, the time is now to consider an alternative path forward. Our 15-page Solution Brief shows the way. Risk Parity is covered only occasionally in the business and financial press. For those interested in going more into the gritty details there are a number of math-heavy academic articles, beyond the scope of this report. The complex dynamics that drive asset returns and a review of the four types or risks and which can and can’t be diversified away. A comprehensive defense of Risk Parity in the faces of the five most common criticisms levied against the concept. In depth examination of theoretical underpining of Risk Parity along with empirical analysis spanning nearly a century.